Uruguay did its best to provoke and frustrate the host nation but Chile ultimately prevailed in the teams' quarterfinal matchup Wednesday, moving on to the Copa America semifinals thanks to Mauricio Isla's late goal. SANTIAGO, Chile — The quarterfinals of the 2015 Copa America got underway here Wednesday evening with an enthralling, and perhaps unsurprisingly volatile, clash between the host nation and a battling Uruguay. The visiting side produced the same stout resistance as in its clash with Argentina in the group phase and came close to surprising Chile with a number of chances early in the second half. Ultimately, however, it was La Roja that advanced to a semifinal against either Bolivia or Peru after Mauricio Isla’s crisp strike broke Uruguayan hearts with just 10 minutes left, producing a 1–0 win. During a tempestuous contest, tempers flared both before and after the goal, and the game ended with players from both sides squaring up to each other after Uruguay’s Jorge Fucile had been sent off. In recent years this fast-paced Chile side, a symphony of movement and intensity under first Marcelo Bielsa and now Jorge Sampaoli, has been one of the more beguiling international teams to watch. After being eliminated by Brazil at both the 2010 and '14 World Cups, this Copa America was seen as La Roja’s golden generation’s best chance to add a trophy to the aesthetic plaudits it has garnered. That dream is still alive, though only just, after Uruguay pushed Sampaoli’s side to the limit here, and Chile looked fragile and even wasteful at times. Although Alexis Sanchez is undoubtedly a world-class talent and defensive midfielder Charles Aranguiz has had an outstanding tournament, some of their teammates, such as Sanchez’s attacking foil Eduardo Vargas and No. 10 Jorge Valdivia, have been less impressive. Valdivia in particular is a frustrating player. Blessed with quick, nimble feet and a taste for the maverick, he is frequently able to find space in dangerous positions close to the opposition area. But often his passes go astray or force a teammate to stretch to control the ball, killing the attacking momentum. •​ WAHL: What cost the USWNT's kit man his job? Yet in the end it was Valdivia, buzzing around on the edge of the box, who rolled the ball smartly to Isla to crack home Chile’s winner and send the delirious home fans out into the streets and bars of Santiago to celebrate. If Chile’s playmaker can continue to show such composure at vital moments, the host nation may just still be celebrating come the day of the final. Uruguay’s dogged, physical performance should not have come as a surprise to anyone, least of all Chile. A week ago, Oscar Tabarez’s side took on other fancied opposition in the form of Argentina and came very close to causing an upset, frustrating Messi & Co. for nearly an hour before Sergio Aguero penetrated an impressive rearguard action. Uruguay produced a similar display here against Chile. The host nation dominated possession throughout the first half, and the ball fizzed into Fernando Muslera’s penalty area on a number of occasions, usually following neat interchanges among Valdivia, Sanchez and the marauding fullback Isla. But Chile’s best moments came outside the box, notably when Valdivia slipped the ball through the legs of Fucile and bore down on goal. That move ultimately came to nothing, however, as did many of Chile’s attacks, dying on the boots or legs of the admirable Uruguayan central defender pairing of Diego Godin and Jose Giminez, or being thwarted further up the pitch by the tireless midfield duo of Arevalo Rios and Carlos Sanchez. Tabarez’s players did not stifle their much vaunted opposition through hard work alone, however. Unsurprisingly for a country with a population of just over three million, Uruguay has long learned how to use every trick at its disposal when taking on bigger rivals, and this evening’s game was no exception. As Rios and Sanchez thundered into challenges, frustrating Chile’s attacking players, Uruguay gradually let the bad feeling on the pitch build. First the teams squared off after Vargas chased a through ball into the area and crashed into Muslera, then Edinson Cavani went in hard on Vidal and was booked after complaining to the assistant referee. The same player would be sent off in the second half after raising his hand to Gonzalo Jara after some unusual, to say the least, provocation from the Chilean defender involving his hand and Cavani's buttocks. Not that Uruguay was alone in using the rough stuff when it needed, and there were plenty of hard tackles from Chilean boots too—plus, of course, the aforementioned moment of arch gamesmanship on the part of Jara. But throughout the game there was the sense that Uruguay, whose limited attacking ambitions here were based almost exclusively on long balls to Cavani and the hard running of Diego Rolan, had more to gain by reducing the game to a (metaphorical) war of attrition. That metaphor almost became reality in the dying moments of the game after Fucile’s fearsome challenge on Sanchez earned the defender a second yellow and sparked a brawl involving almost every player on the field, with a number of the Uruguayan players having to be restrained from further violence. It was not an unfamiliar sight for those used to watching Uruguayan soccer, particularly following a defeat, and is perhaps a logical, though unjustifiable, overspilling of the country’s intense footballing pride and determination. A year to the day after Luiz Suarez decided he could resist the tantalizing sight of Giorgio Chiellini’s shoulder flesh no longer, earning himself a nine-game ban from international soccer in the process and forcing his exclusion from this Copa America, it was the disciplinary vagaries of another Uruguayan striker, Cavani, that cost his team dearly at the Estadio Nacional. 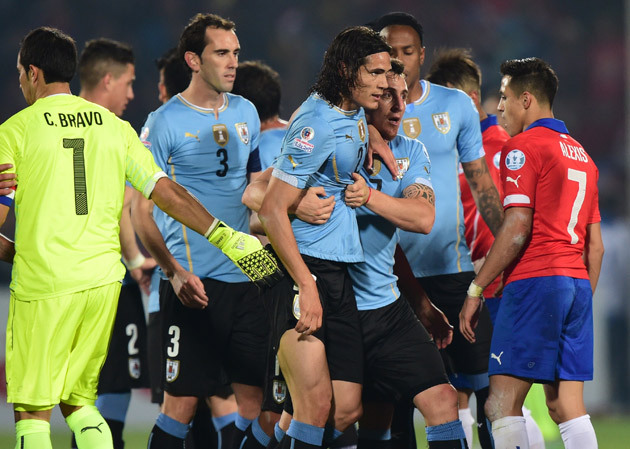 In the end Cavani decided to stay, though his teammates may have wished he hadn’t. While the striker had a thankless task to perform up front in a defensive-minded side, there was little excuse for the yellow card he picked up when verbally abusing the assistant linesman during an admirably organized first-half display from his side. And while there may have been little aggressive contact involved in the clash that earned him his second-half expulsion, the decision to raise a hand in reaction to Jara’s prison yard provocation was foolish in such a tightly fought, volatile game. His sending-off came at a time when Uruguay had looked at its most dangerous, and just a few minutes after Cavani himself had sent a blistering long-distance shot over the bar. It also gave Chile, and the crowd, just the excuse it needed to turn up the pressure. Uruguay lost some of its shape, as well as its most obvious out ball, and it was not long before an overworked defense finally crumbled and the home team grabbed the goal it needed through Isla. Chile may have scored anyway, but Cavani’s poor discipline gave Sampaoli and his players a generous helping hand.